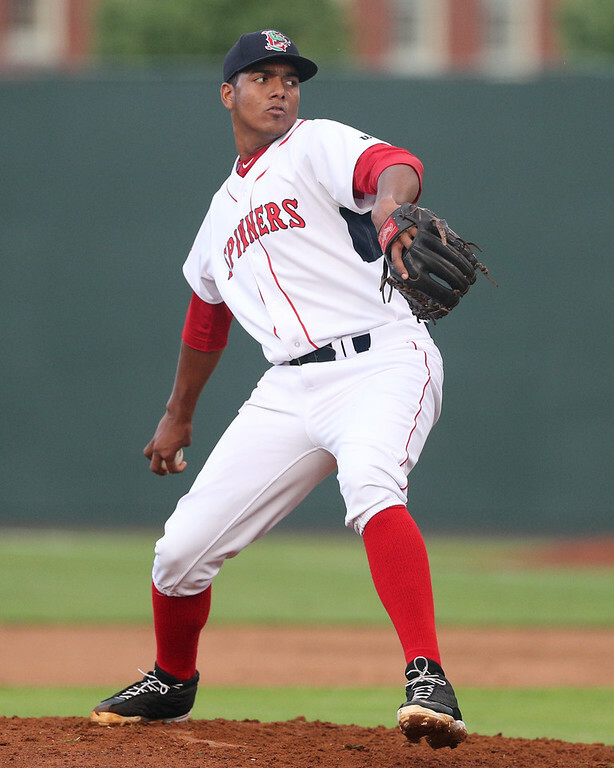 4/7 Cup of Coffee: The weather did not cooperate for both Pawtucket and Portland, but there were some solid performances last night in the lower minors. Salem rallied for a walk-off win while top-20 prospects Jake Thompson and Joan Martinez pitched well and Cole Brannen led Greenville's offense in support of Kutter Crawford and Denyi Reyes (pictured, right). The season opener for the PawSox was snowed out, which is one of the most depressing sentences a minor league baseball blogger can write. The season will kick off on Saturday at 1:35 p.m. and Friday's game will be made up when Lehigh Valley is back in Pawtucket at the end of May. A combination of rain and snow postponed the second game of the Sea Dog's season. The series will resume Saturday at 3:05 p.m, with Friday night's game being made up as part of a doubleheader on July 17. A three-run rally in the ninth inning propelled Salem to a walk-off victory. Down 3-1 at the start of the frame, Bobby Dalbec cut the lead in half with a leadoff home run, his first of the year. After a double from Ryan Scott and a single from Tyler Hill put runners at the corners with one out, Jerry Downs hit a single to center field to score Scott and Hill raced home with the winning run after the center fielder threw the ball away. Jake Thompson, Boston's fourth-round pick in last year's draft, had a stellar full-season debut, allowing three runs, two earned, over 5 2/3 innings with two walks and four strikeouts. Joan Martinez picked up the win with two scoreless innings of relief while striking out four. Downs was the only player with multiple hits for Salem, while Hill added an outfield assist at home in addition to scoring the winning run. Dalbec had two fielding errors and struck out twice as part of an up-and-down night. There was another solid pitching debut in Greenville as last year's 16th round pick Kutter Crawford tossed four innings of one-run ball, striking out five while allowing two hits and two walks. Denyi Reyes was even better out of the bullpen, allowing only an unearned run while striking out five over five innings. The Drive's 11-hit offensive attack was led by second-round pick Cole Brannen, who bounced back from a tough opening night to go 2 for 5 with a triple and a stolen base. Left fielder Victor Acosta left the game after being hit by a pitch in the third inning, and his replacement Michael Osinski went 2 for 3. There is no word on the severity of Acosta's injury. Player of the Night: After performing at every stop in the minors so far, it should not be surprising that Denyi Reyes got off to a hot start in Greenville. Reyes was a 2015 Dominican Summer League All-Star and a 2017 New York-Penn League All-Star, and he also had a good showing in the Gulf Coast League in 2016. With a fastball that only touches 90 he needs to be able to move and locate the ball well, and he has done just that in his minor league career as he has walked only 14 batters in 176 2/3 innings.